I myself will see him with my own eyes – I, not another”(Job 19:25-27). Job is somewhat a complex story to follow. Some elucidation may help to follow the logic of the story toward grasping the great theological theme involving man and his faith in God, and God’s response to it. The issue of ‘faith and suffering’ that troubled Job continues to remain as humanity’s most puzzling question through its entire history. Translated, it stands as, why a righteous (or religious) person is afflicted by evil and suffering, and why God seems unresponsive to the supplicant who is in dire need. For Job, the issue was beyond the religious reasons: It was about the possibility of any flaw that God had found in Job’s faith, love and devotion to Him. Job sought clarity on this so he could correct it. While asserting that he was innocent, he sought to know from God Himself why he was being severely punished. And, as for himself, he avowed before God in the hearing of his friends that he himself could see no fault in love for his God. Job’s story brings out some issues we may want to consider as we practice our faith and religion while expecting God to respond with favors to our prayers and offerings with timely help when we regularly called on Him, and in need, especially. Just as the pious person expects God to be favorable to his entreaties, an immoral and ungodly person could be expected to understand some devastation and suffering on him as a fair consequence. Yet, we also see many immoral people prospering. Another one: if we believe that God’s work in human life depends entirely on the simple formula of good reward for our good life, and punishment for godless life in an automatic process, where is God’s prerogative in deciding the destiny of man beyond these two factors? As such, from his experience Job realizes that man’s destiny cannot be explained by simple religious formulas people hold. He also acknowledges that man could never put together ‘good’ in any form that can satisfy the ‘ultimate Good’ in God. As such, the destiny of the imperfect man requires ‘Grace’ that God alone must offer. Grace covers many things humans over look. This also gives a limited view that every good in life is God’s active presence; every evil means God’s absence. This view does not adequately explain hardships caused by humanity upon itself, and by the Devil. This is the essence of the story of Job – an error humanity held and the Devil nurtured. It is compounded by another factor. When a virtuous person unjustly experiences loss and affliction, his disappointment with God can be expected. His first reflection could be, “What did I do to deserve this?” – again, the issue of good and bad. Job’s story illustrates this aspect. And also, it is not unexpected to hear good people in pain saying, their suffering was unjustified, unfair and undeserved, while those who deserve punishment do well in their lives. They might also be blaming God; being angry at Him; or feeling that God was indifferent to their piety and their problems as well. All such people seek answers, and rightly so. The story of Job is about such enigma that eternally keeps troubling humanity. This enigma gets complicated with the issue differently defined in heaven between God and Satan. This being, “Can man’s faith and love for God stand without favorable support from God?” Simply put, “Would man’s faith in God weaken when God does not grant favors for man’s good piety and deeds; even disregarding hardship that hurts him?” “True faith and love of God never weakens” said God. “It fails under adverse condition” refuted Satan. 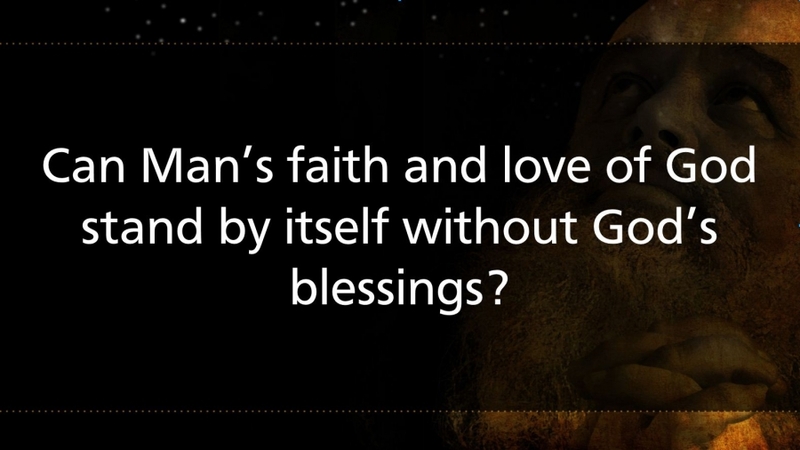 This is the test on the true virtue of faith and love of God. In Job’s story, the human actors unknowingly acted the same plot but with a different understanding. Job is an important book of the Bible on the subject of life, man’s faith in God and God’s response to it. The story is about a virtuous man Job, his suffering and the problem of understanding God and His work in relation to his faith. Despite all the sudden catastrophic loss of everything Job held on to faith in God whom he devoutly loved. Yet he struggled to understand why it all happened, and he wanted to know it from God Himself. At the same time, Job himself was suddenly stricken with gruesome sores all over his body. He cried out to God in deep agony. Reacting bitterly, his wife told him to cease faith in God, denounce him and die. His friends who came to visit Job strongly suggested that the cause of the sudden catastrophe was indicative of God’s displeasure with Job’s faith and religious practice. However, the disputing Job thought that there was something more to his situation than mere religion. Refusing their arguments with equal vehemence, Job declared, that he would not “deny his integrity” (27:5b), and even “through he (God) slay me, yet will I hope in him” (13:15). Understanding the issue of “suffering” in life on earth, two diverse views were debated by these two parties: Job on one side, his friends on the other; neither yielding positions. Finally intervening, God does not respond the issue on hand. His answer was clothed in His sovereign prerogative to do what He wills; not what man wants. At the end, and true to the issue contested in heaven, God’s implicit revelation was His requirement on man: that man should remain true to Him in faith and love under all circumstances exactly as Job revealed through his ordeal. The problem of understanding life on earth and the efficacy of faith in God is made more complex by God being unseen, unheard and imperceptible. This presents difficulty in understanding God, His will and work about human life. This has been an enduring enigma and humanity’s doleful theme of life since the inception of its religious thought at the dawn of the civilization (Sumer: about 3,000-2,500 B.C). In the ancient Sumerian story, the righteous but the suffering man desperately pleads with his god desiring to know the reason for his silence at the time of his suffering. In the story, the Sumerian theologians had the man conclude: No matter how undeserved might be one’s misfortune and suffering, the only way open to the victim was to trust and glorify his god unconditionally. That was the closest answer they came to satisfy themselves with. The Biblical story of Job is a grand epical embellishment of this grand old enigmatic theme. This story was about the various angles of a righteous man’s unmerited suffering. The story of Job is of this kind, but with a difference. Job was blameless and upright; he feared God, and shunned evil and he was the greatest man among all the people of the East. God’s own assertion about Job was that, “There is no one on earth like him; he is blameless and upright, a man who fears God and shuns evil” (1:8). Now Satan decided to test Job’s integrity in faith and love toward God. He challenged God’s trust in Job, and as he would have it, he ventured on proving God wrong. So, he hits Job with disasters - one after another. Job lost all his wealth including the lives of his sons and daughters. Even as all this devastation was happening around him, Job refused to find fault with God; rather, he fell on the ground and worshiped Him with these words on his lips: “Naked I came from my mother’s womb, and naked I will depart. The Lord gave and the Lord has taken away; may the name of the Lord be praised” (1:21). In the story, God had allowed Satan to afflict Job, for God knew that Job’s faithfulness to Him would neither waver nor cease, and that his integrity would not tolerate a blemish. Yet, when his wife was angry, demanding Job to curse God and die, Job’s reply was: “Shall we accept good from God, and not trouble?” (2:10). The story continues as a long and substantive discourse on two opposing viewpoints that were the issues in the story. One, the primary duty of man is to keep integrity in faith and love for God regardless of the circumstances and God’s total silence; two, to earn God’s favors the need for correct course in religious faith-practice to ensure These two points were played out by Job’s friends It went on between his friends and Job himself. After Job was hit with great calamity, friends came to see Job in his distress. However, their contribution was no more than passing judgment on Job’s situation as due to his conduct. They charged that there was error and sin in Job’s life and that he was not as just as he claimed for himself; was unjust as well to men in his employ and therefore guilty before God. Even so, their conclusion was that Job’s affliction was God’s punishment. The only course open to Job, they asserted, was to confess his sins before God, and seek His mercy and forgiveness. In spite of such strong claim to his perfection, Job acknowledged that no man could be deemed perfect when God - the Supreme Judge confronts him, and that God could still find fault in a person’s faith and work. Notwithstanding all this, Job had this pervading predicament:Why God’s disfavor persists when a man’s character and religious conduct was perfect to the full extent of his conscience. In his case, Job wanted to hear from God what his imperfection was so he could correct it.